Providing sort of a golf experience/history lesson combined into one day, each hole is named after some significant person, item, or event in the Texas fight for independence. 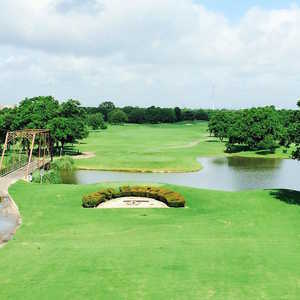 For example, one hole is named Sam Houston, while another is named after a pair of twin cannons: Twin Sisters. No. 8 is one of the signature holes, a 175-yard poke over the water to a green that is shared with the par 5 No. 1. A waterfall accents the edge of the lake, providing a unique aesthetic. 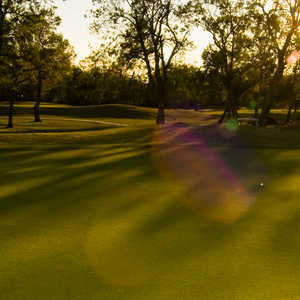 On the back, the finishing hole is fun because you can play aggressively off the tee, free of major hazards in the landing area that is framed by mounding. The approach must carry water, and you'll need to take an extra club because the green is elevated. Getting there : From Houston, take Hwy. 610 and loop around the city to Hwy. 225 east. Take the first Deer Park exit and turn right onto Georgia St. Next, drive 1 mile to the course, and look for the entrance on the right side of the street. Hard to beat what you pay for here. 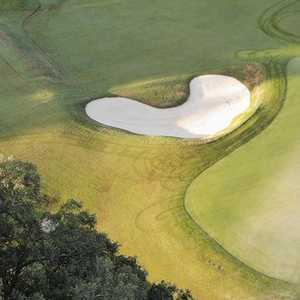 Fairways and greens are well-kept, and the GPS on the golf carts are a plus.